This article is about Mario's side special. For Meta Knight's down special, see Dimensional Cape. Mario's Cape in Super Smash Bros. for Wii U.
Cape (スーパーマント, Super Mantle) is Mario's side special move. Mario swinging his Cape in Melee. Mario pulls out a cape and swings it in front of him, reflecting projectiles and reversing hit characters. The cape starts to reflect projectiles at the frame 6. This also applies to Dr. Mario with his Super Sheet. The cape has a multiplier of 1.5× when a projectile is reflected. The cape can flip shielding opponents. Also, the cape will briefly reverse an opponent's momentum (not in Super Smash Bros. Melee). Shortly after an opponent is flipped in the opposite direction, if they make a directional input such as a forward roll, they will instead roll backwards. This seems to affect most (including buffered) inputs made while being caped. This also does not work in Melee. Mario's Cape deals up to 10% damage, dealing no knockback and doesn't make opponents flinch except for in Melee when used on an opponent attempting a grab, which deals slight knockback. Characters hit with the cape while attempting a grab will be sent spiraling a short height into the air. This means that it will not interrupt attacks; rather, it only turns the enemy character around, leaving their hitbox active. It can leave recovering characters unable to grab the ledge. This is less potent in Super Smash Bros. Brawl and Super Smash Bros. 4 due to their differing ledge mechanics, in which characters can grab ledges regardless of which direction they are facing. The cape can be broken in the same manner as any other reflecting attack can; if the damage the oncoming attack can break a shield in one hit, the cape will not work and Mario will be stunned (in Melee) or get hit by the attack (since Brawl). 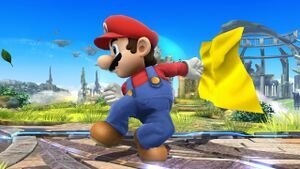 In Super Smash Bros. 4, Mario's Cape can reflect projectiles behind him as it is swung from his back upon use, but it requires timing. The damage has been nerfed over time (10/8 in Melee to 8/6 in Brawl and 7/5 in Smash 4). The move has a sweetspot closer to Mario in Melee and the move is weaker in the air in all games. This move can be B-reversed if the the player has the timing. If used on someone in Brawl while taking knockback from an attack, it multiplies the distance by about 1.6. The Cape can also be used for multiple advanced techniques; Cape glide, the Cape Dash (reverse Cape glide), the Cape Boost (Meta Knight insta-kill), Cape Induced Landing Lag, and Edge Cape-cancel. These techniques only work in Brawl. In Super Smash Bros. Ultimate, the animation is changed aesthetically, as Mario is now wearing the cape around his neck while he swings it. In addition, Cape now forces opponents to show their backside once reversed. Because of that, it is the only way to see the backside of characters with a mirrored stance (such as Mario himself) without using glitches. When Mario uses his Cape on an enemy that is increasing their height (jumping, mid-air jump, recoveries, footstool jump, etc), the enemy will increase their height much higher than normal. If Cape hits an opponent about to sweetspot a ledge, the target will go into a ledge grab animation in the opposite direction. The opponent's edge recovery will also be performed in reverse, after which the glitch ends. Super Sheet in Smash 4. Super Sheet (スーパーシーツ, Super Sheet) Dr. Mario's version of Cape. It deals more damage than Cape (up to 12% rather than 10%). A disadvantage is that Super Sheet only stalls Dr. Mario once in Melee, and not at all in Super Smash Bros. 4 and Ultimate, making it less useful as a recovery option. The sheet has the same multiplier as the cape, 1.5× when a projectile is reflected. In Super Smash Bros. 4, Dr. Mario can reflect projectiles behind him as he must swing it from his back upon use, though this needs precise timing. The move has more vertical but less horizontal range than Mario's Cape. In SSB4, it also has a longer window of time to reflect projectiles than Mario's, making it easier to use as a reflector. In Ultimate, it gains a different animation to reflect its greater vertical range compared to the Cape. Changes to Dr. Mario's attack multiplier result in reflected projectiles dealing slightly more damage compared to Mario, although the 1.5× multiplier is retained. "Whips out a cape to spin opponents around and reflect projectiles." "Whips out a cape that zaps opponents. Doesn't reflect projectiles." "Create a gust of wind with low attack power that can push back opponents." "A sheet that rejects projectiles. Has a short reach but a wide vertical range." "Launch foes with an electrically charged sheet. Can't reflect projectiles, though." "Use your sheet to whip up a gale that damages foes while pushing them back." Shocking Cape/Sheet: The move has very slightly more startup, and moderately increased ending lag. The Cape/Sheet has an electrical effect that does 11.2% damage and decent knockback, KOing Mario at 99% at the ledge. but it destroys projectiles instead of reflecting them (though this could be considered more potent against controllable ones) and cannot turn the opponent's facing direction. The ability for Mario to stall in the air is still retained to a lesser extent, but any horizontal momentum Mario had when performing the move will be preserved. Gust Cape/Breezy Sheet: The Cape/Sheet is granted a small windbox which can push opponents, with the sweetspot and sourspot being indicated by two visual effects. It retains much of the functions of the regular Cape, but the move has more startup and ending lag and does slightly less damage than the regular Cape, only dealing 5% damage, although it has the same reflection multiplier. The move also stalls Mario in the air slightly more effectively (comparable to Brawl), and does not reduce his momentum as much. 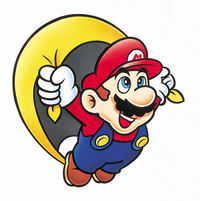 Artwork of Mario gliding using his Cape from Super Mario World. In Super Mario World, the Cape is a power-up obtained from the Cape Feather, which transforms Mario into Cape Mario. While wearing a Cape, Mario can perform a spinning attack, using it to attack enemies and destroy most projectiles. Additionally, by holding the jump button while airborne Mario can slow down his fall. The cape can also be used to fly great distances after a running start: in this state Mario can stay airborne indefinitely by diving and pulling up at regular intervals, which allows him to skip large portions of some levels. The Cape's floating capabilities in its source game could have inspired its ability to stall Mario in midair in Smash Bros.
Mario using Cape in Brawl. Cape in Super Smash Bros. for Nintendo 3DS. Mario reflecting a projectile in Super Smash Bros. for Nintendo 3DS. Super Sheet in Super Smash Bros. for Nintendo 3DS. Cape as shown by a Skill Preview in Ultimate. Super Sheet as shown by a Skill Preview in Ultimate. Cape can be used on a taunting character to make them face the other way in manners that are otherwise impossible, like making Wario face the screen while doing his side taunt. This was removed in Smash 4 to instead turn the character to the perspective of taunting facing the other way. In Ultimate, hitting a character with a mirrored animation (such as Luigi or Yoshi) causes them to face away from the screen until they move or attack. If timed correctly, the part of the animation where Mario/Dr. Mario is still putting away his cape/super sheet can still reflect projectiles near the very end, but possesses no hitbox. If timed correctly, when using the cape on an opponent that is just hitting the ground, the opponent will take longer to hit the ground. If Mario uses his Cape while in the Online Practice Stage, the cape will look sparkly and be of a lower-quality graphic. If one were to pull off a "reverse reverse Falcon Punch," or using Cape on a reverse Falcon Punch, Captain Falcon will be pushed back as he punches. In Brawl and SSB4, the Cape momentarily gives the opponent super armor after it hits them. When hitting both a Bob-omb and an opponent at the same time, said opponent will take no knockback but full damage from the resulting explosion. If this is performed on Nana as she is KO'd, she will have a type of super armor when she respawns, lasting until she is KO'd again. She will be invulnerable to all attacks except grabs. In SSB4 and Ultimate, when the Cape or Super Sheet hits an opponent, it makes the same sound from Super Mario World, only sped up. While the Cape and Super Sheet can reflect Bayonetta, it does not reflect the position of her forward smash. The trophy for the Super Sheet in Melee states that it is "longer and thinner than Mario's Cape." While the Super Sheet isn't visually different from the Cape beyond color, the hitbox confirms the trophy description. It appears as though the 3rd custom version of the move would have had Mario swing a considerably larger cape, with the same properties as the normal one but it would only deal 1% damage. In Ultimate, using the Cape on Ryu (and Ken) in a 1-on-1 match flips him only for a brief moment before turning back to face Mario. This is due to the new mechanic unique to him where he will always face his opponent during 1-on-1 matches. ↑ FireMario149. ~How to Play Mario: Cape Invincibility Frames [16/18] (Video). This page was last edited on April 22, 2019, at 19:08.